Eye lesions may gradually increase in size, though it may take the lesions a number of years before they reach a noticeable size. Most lesions cause surface irritation, resulting in constant redness and discomfort. 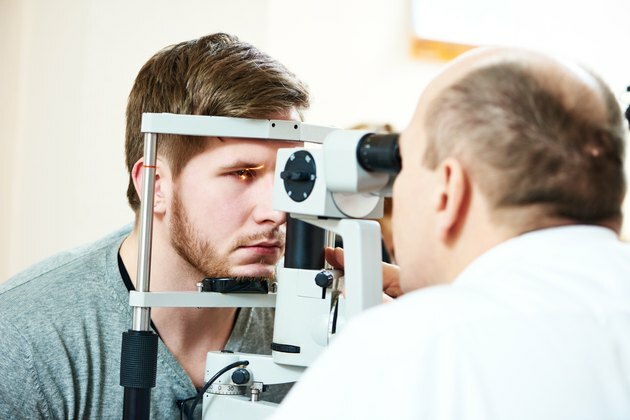 People with such symptoms should have the lesion evaluated by an eye doctor to determine treatment, which will depend on the type of lesion and the cause. Pinguecula, small lesions that usually have a yellow tint, grow on the white of the eye. These raised bumps do not have cancerous qualities, and they do not usually interfere with vision. Sun exposure may increase the risk of acquiring this type of lesion, reports the University of Maryland Medical Center. Pinguecula may cause surface irritation, particularly as the size of the growth increases. Over-the-counter artificial tears may help improve comfort. The lesions do not require treatment or surgical removal unless the lesion causes severe discomfort or the size interferes with proper eyelid function. A pterygium starts growing on the white of the eye, slowly spreading onto the cornea, the clear front of of the eye. The growths often have a triangle shape with a fleshy appearance. Research links an increased risk for a pterygium with sun exposure, states the National Eye Institute. The pterygium may cause redness and irritation. Artificial tears may help with minor symptoms. Extended growth may eventually interfere with vision. In such cases, an eye surgeon may recommend removing the pterygium, though the growth may return. Another type of lesion may appear on the white of the eye. This spot, called a conjunctival nevus, may have a dark pigmented color, or may appear clear and slightly raised. In many cases, the nevus will reach a certain size and then stop growing. However, if a nevus continues to grow, a doctor may perform a biopsy of the lesion to determine if it has cancerous qualities. Most nevi are benign, but some are malignant, meaning that an early evaluation and diagnosis is vital, according to Bradley Kirkwood, an ophthalmic nurse specialist, of Queensland, Australia, in a January 2010 article titled Pigmented Conjunctival Lesions. A small nevus may not cause any discomfort or surface irritation. Larger nevi may cause irritation and inflammation of the surrounding areas. Lubrication with artificial tears may help, but if surface irritation increases, a doctor may prescribe eyedrops to relieve the discomfort.